Everyone knows Bali, but not many know of Lombok. Much less the Gili Islands. Early July, I had the pleasure of venturing about these Indonesian islands, and I have to say, it was a marvellous vacation. A country I've become increasingly acquainted with, for particular reason, it's filled with warmth and wonder. Unlike Bali, Lombok is a lot less commercialised. It also in effect 'feels' much more conservative; something for the female traveller to note. Right out from the airport until you arrive at your resort, I suggest you clothe yourself modestly. I made the mistake - not the first time - of showing some collarbone and even though I donned my kimono cardigan, I could feel eyes on me. 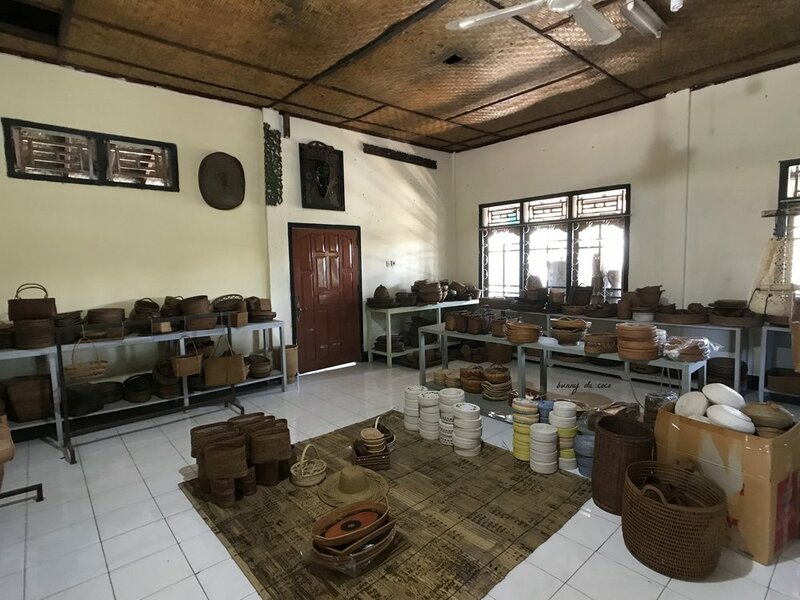 Lombok is also where majority of those rattan basket bags (my great love) and weaved products that are highly popular these days are produced. They're made in little villages where the craft has had a long and rich history, and many offer tours to take a peek at the local craft. To start with, the trip commenced with the majestic view of mount Agung cooling off after its eruption just a few days before. Not an everyday sight, I reckon. Mount Agung cooling off after an eruption, as seen from my airplane seat. 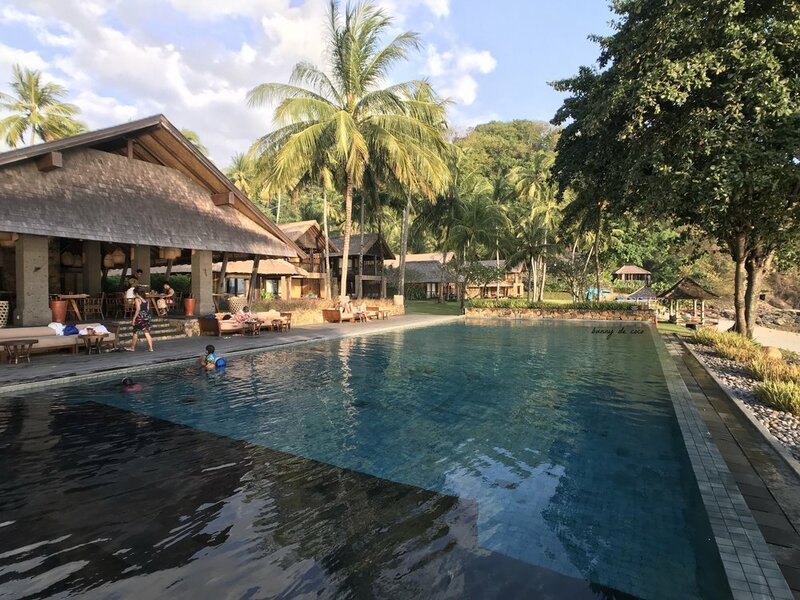 We spent a night at the Jeeva Klui Resort in Lombok, which is where a special event of ours is meant to take place in December. I'll let the pictures do most of the talking for the rest of this post. Past the reception area, you can see a glimpse of paradise between the trees. What lies beyond the trees: a pretty pond and a pool right in front of the sheltered dining area for guests to take a dip. We had the fortune of taking one of the beach front rooms, which was lovely. 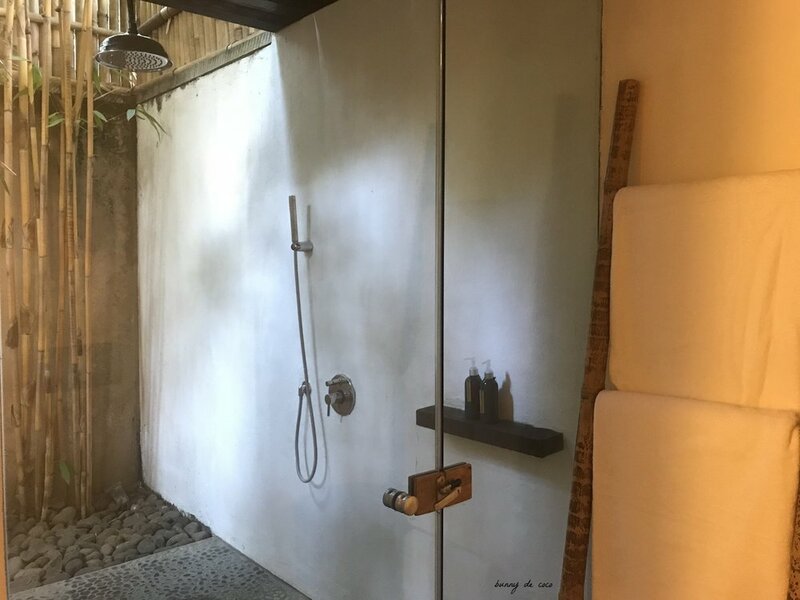 It had a large bathroom with an outdoor shower too. Double-storeyed lodgings. Our beachfront ground floor room. Just a few metres walk from our room: Al-fresco dining for love birds. Beautiful at sunrise and sunset. And you could walk right down to the beach. The resort is temporarily closed due to the damage caused by the recent earthquake, but hopefully will reopen in a couple of months' time. 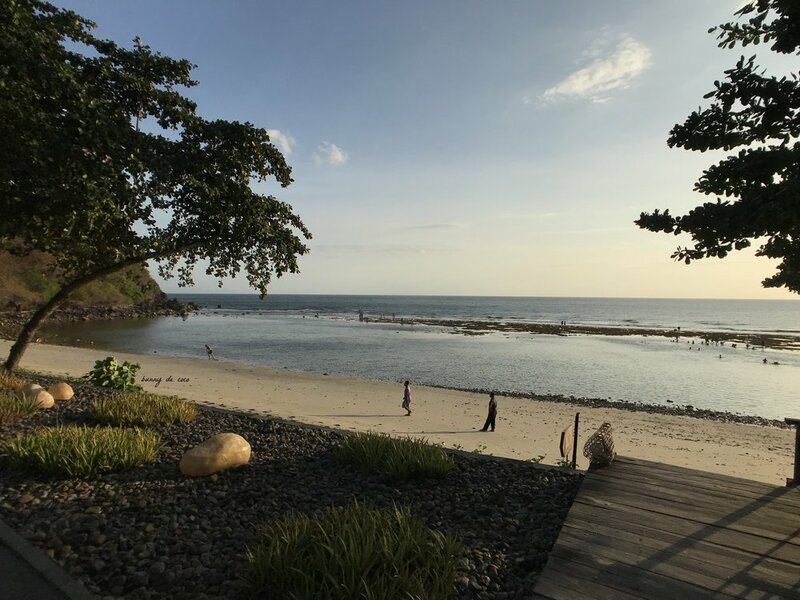 Jeeva Klui is pretty quiet which makes it fantastic for relaxation or even to get work done, has great hospitality and service, plus you get to view a rather private, clean and tidy beach when you wake from your nap or look up from your laptop. (Versus the view of the butts of many other tourists) One thing the place could improve on though is the flooring - which tends to be very uneven and creates ample opportunities to tripping. There's also another resort - Jeeva Santai - by the Jeeva brand that looked magnificent when we took a peek at it. It is more exclusive, with private pool villas. I will do a review come December after my stay there. We started the next day with a full breakfast at Jeeva Klui, before making our way to our next destination - Jeeva Beloam Beach Camp. On the way, we stopped by some craft shops. In the village of Sukarara, it is compulsory that the ladies learn to weave, or they can never marry/ be marriage material. The village's store sells the women's handmade scarves, traditional costumes, tablecloths and the like. Me trying my hand at the weaving loom. The local village guide who speaks fluent English gave me an introduction to the craft and also let me try my hand at the weaving loom, which was a thoroughly interesting experience. I absolutely loved the colours of the scarves. Pieces take a few weeks, up to a few months, for a lady to complete - depending on design -, and they sit at the loom for at least 8 hours a day. The guide acknowledges that sitting upright with one's legs straightened under the weaving loom for that many hours is bad for a man's wellbeing, and says that it is why only women do the weaving. While I questioned whether it was any better for a woman's wellbeing, I left the conversation there and did not question the village's tradition. Our next stop was a shop that specialised in rattan weaving. As mentioned, many of those weaved rattan bags you see being flaunted by Instagram influencers are made in Indonesia - particularly in the villages of Lombok. The weaved products are then brought to Bali and the more commercialised islands for sale, and of course they also export overseas. From bags to baskets, stationery holders to dustbins, the shop primarily does manufacturing for bulk orders, but you can also purchase loose pieces available at the shop. While I don't have a picture or video to prove it, take my word for it when I say that the road to our next destination was the rockiest road I've ever been on. 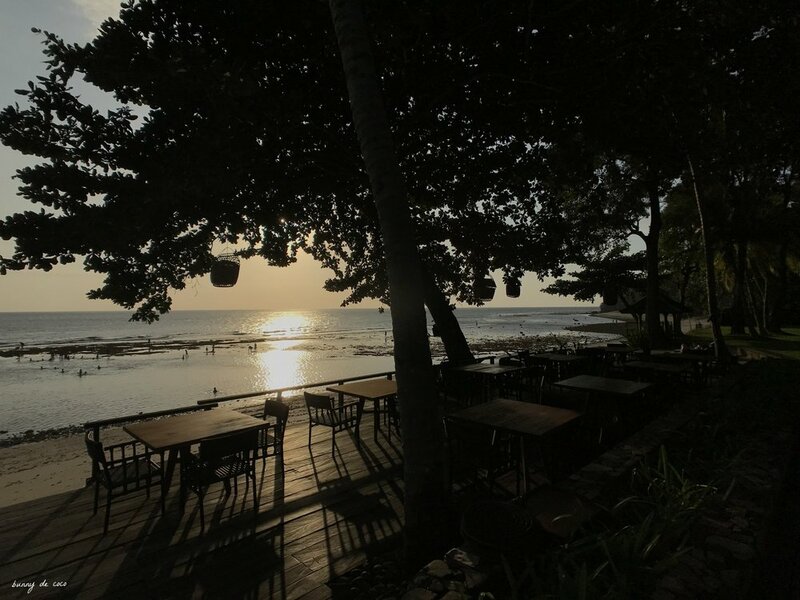 For all its beauty, I recommend you do not dine before hitting the road to Jeeva Beloam Beach Camp. Or you will feel sick. Like, literally. This is also the same road you would take if you visit the Pink Beach, so do take note. A secluded cove with two white sand beaches, Jeeva Beloam Beach Camp nestles in a 55-hectare nature forest preserve. 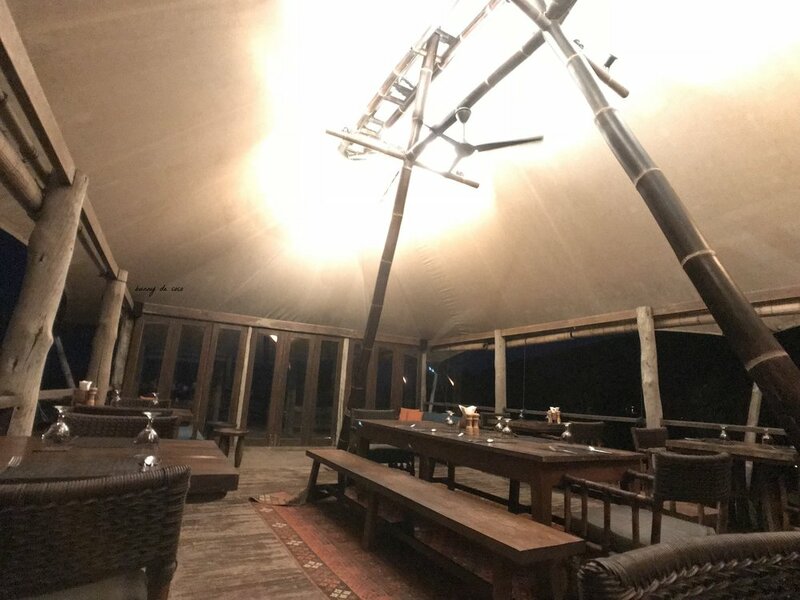 The Jeeva Beloam Beach Camp reminded me of a safari camp; it almost feels like you're in the wilderness of South Africa. The Camp uses its own power generator, so shower times are limited to certain time slots and air-conditioning only lasts till 5am. The air is cool there in the evening and morning though, so it wasn't really a problem. 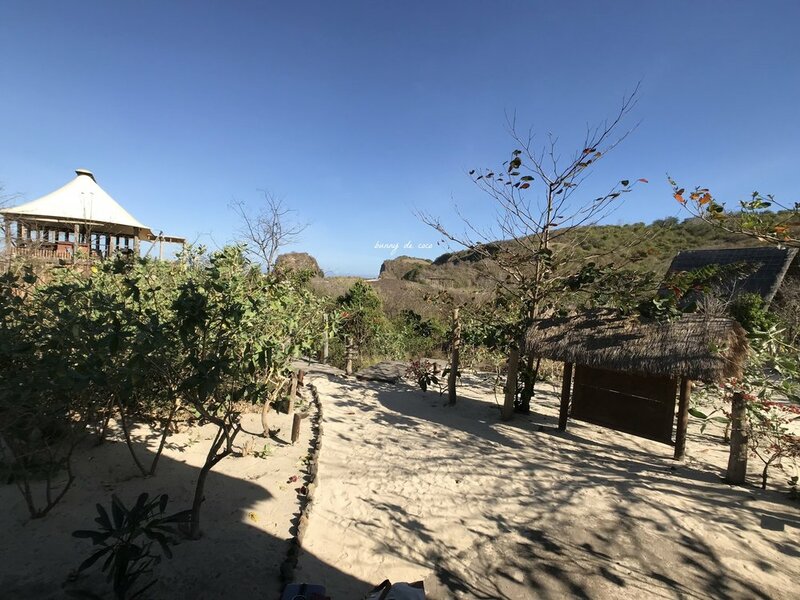 There are just eleven 'Pantai Berugas' lodgings, with the view of the Timor Sea, which makes the Camp very exclusive. The dining area, at night. Dinner time: this was followed by my favourite Pulut Hitam for dessert. All-you-can-eat breakfast: I had Nasi Goreng & Banana Pancakes! Looking for your own private beach in Indonesia? The best thing about Jeeva Beloam Beach Camp is... its beach! Pristine with turquoise waters, and oh-so-exclusive (only Jeeva Beloam Beach Camp guests would have access to it). And with such a small number of guests that the resort houses each time, you could easily find yourself the only person hanging out by the beach. If you'd like to know what it feels like to live by the sea and you're looking for your own 'private' beach, Jeeva Beloam Beach Camp is your place. Just be sure to load on the sunscreen and insect repellent! After some time at the beach, we left for the Gili Islands. We were to stay at the Pink Coco Gili Air for one night before leaving Indonesia altogether the next day. So, about two over hours by car from the Beach Camp and a short boat ride from Lombok, we arrived at the shores of Pink Coco Gili Air. There are three Gili Islands, of which all do not permit any type of motorized transport. To get around the islands, you can rent bicycles or travel via horse carts, locally known as ‘Cidomos’! Pink Coco in particular is into earth-saving and healthy living. The resort does not serve cow, uses local produce for food, and doesn't use plastic straws. Just to name a few. A brand new resort which just launched a few months ago, Pink Coco Gili Air also has a sister resort on the Gili Trawangan island. 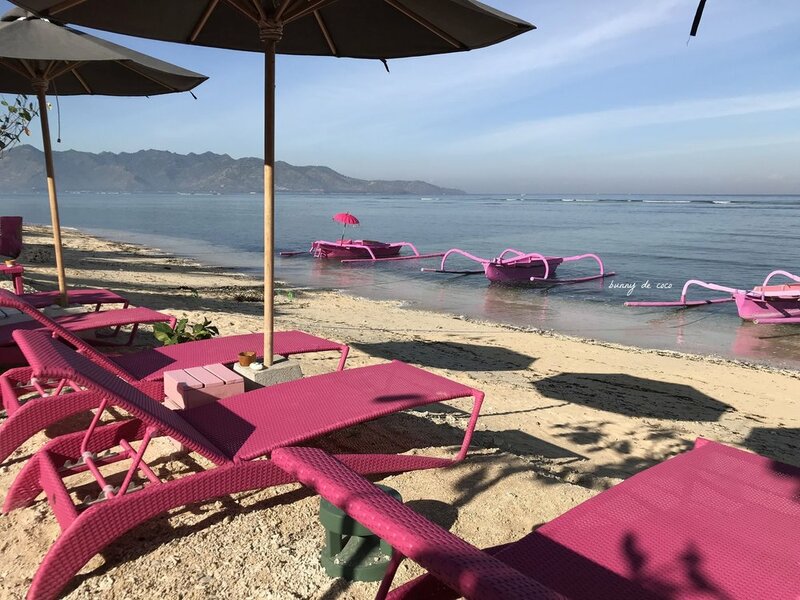 For a resort that had just launched, Pink Coco Gili Air was doing incredibly well; its beach bean bags and sun loungers all well-utilised by basking European travellers. The view from the second floor of the restaurant-bar. Their handmade gnocchi was delicious! As you can tell from the pictures, Pink Coco is all about the colour pink. It feels like a happy place when you're there, and as you dine by the resto-bar, you'll see fascinated travellers from other parts of the islands stop by on their bikes to snap a picture of the oh-so-pink resort. The rooms have lovely interiors too and the one we stayed at was the Limas Romantis Villa, conveniently situated next to the spa parlour. It had a super-spacious double bathroom and the bedroom was furnished with a giant stone tub. Interestingly luxurious, you really couldn't complain. We spent the rest of the day relaxing by the pool and then catching the sunset by the beach with a cocktail in hand. I managed to get a fantastic night's sleep but we had to get up pretty early the next morning for breakfast - we had scheduled a massage and pedicure session before our planned departure later that afternoon. Did I mention that the hotel booking comes with a complimentary spa session of your choice? Not the most flattering view of my limbs, but you get the drift. With excellent service, more-than-comfortable lodgings, an obligatory pampering session, - all at a reasonable rate - I felt Pink Coco may have done the deed of overindulging me. I highly recommend the place if you're heading to the Gili Islands, as it deserves recognition. And while I didn't have the time to go about the island and discover what else was around, I will be returning come December. Sadly, the Pink Coco Gili Air resort has also been affected by the earthquake and is temporarily closed. While I simply can't wait to be back here in December, I sincerely hope the resorts in Lombok and the Gili Islands will be able to recover swiftly from both the disaster damage and the loss in tourism. It truly is such a wonderful destination - more travellers should know about it.